…His name was Laszlo Lowenstein… In this brand-spankin’ new edition of The Podwits Podcast, the boys are talking movies, and more specifically, their favorite comedies. What do they find funny? What do they think (in their HUMBLE opinion) was a miss? And what the heck is up with Arnold Schwarzenegger giving away spoilers for all his new movies? And then there are the Bible epics!!! 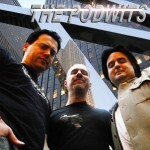 Well the Podwits are here to answer all your questions this week, so come have a listen!